Originated in China, the use of apricots started almost thousand years ago. Available all around the world today, apricots are a favorite amongst people of all ages. This musky tart fruit can be eaten raw, cooked, dried, or even as a juice. It is used for making jams, squashes, and jellies. Similar to plums, it has a soft, tangy flesh underneath a thin outer skin. Even the seed of the fruit can be used for extracting essential oil. Apricot is a sweet fruit with a wide range of health benefits. One of the best ways to reap the benefits of this tasty fruit is through juicing. But before you juice your apricots, you need to remove the pit of the fruit. Also ensure that the apricots you are juicing are fully ripe or you will end up with a glass full of juice that is just not drinkable. Apricot juice can be thick but you can add a citrus fruit or an apple to dilute it and make it more palatable. Loaded with nutrients and minerals, apricots work to keep the body healthy and fit. 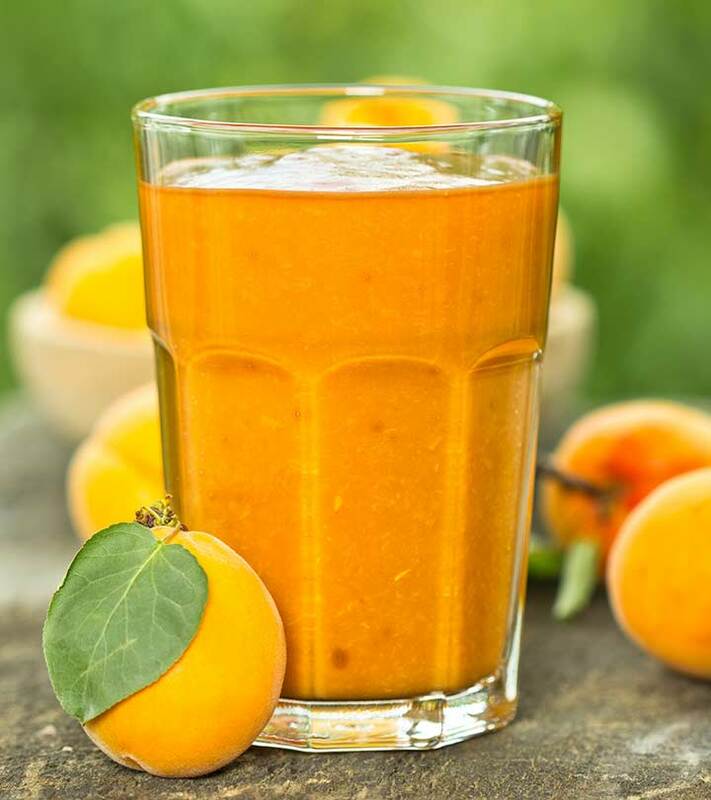 Apricot juice also provides the same benefit as raw apricot. Apricot is a rich source of vitamin C and helps to improve skin elasticity. It also helps to make hair strong and beautiful. The nutrients present in apricot juice promote hair growth and stalls hair fall. If you need strong bones, drink apricot juice! It contains a significant amount of calcium, iron, copper, phosphorous and manganese, which are essential for strong bones. 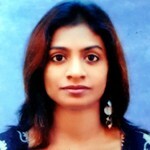 It also helps to prevent age related bone problems like osteoporosis. Apricot is a rich source of fiber. Generally, all the fiber present in a fruit is lost during the process of juicing. But that is not the case with apricot! Apricot juice retains most of the fiber and helps relieve constipation. The laxative property of the fruit ensures smoother bowel movements. Apricot is a wonder fruit that helps to keep your heart healthy and strong. It protects the heart from strokes, heart attacks, and atherosclerosis. The vitamin C content in the fruit protects the heart from free radicals, while the potassium relaxes the blood vessels and arteries, lowering blood pressure. The dietary fiber in apricot helps to clear the vessels and arteries by scrapping the cholesterol and reducing the strain on heart. Apricot juice helps to prevent cancer. The antioxidant and the carotenoids help to treat cancer. It also cuts down free radical in the body. Apricot juice consists of lycopene, which helps to prevent cancer. Anemia is a common problem that plagues women of all ages. Rich in iron and copper, apricot helps to create hemoglobin in the body. It helps to fight the symptoms that come with anemia, such as fatigue, metabolic functioning, weakness, light-headedness, and digestive issues. With lutein, zeaxanthin, and carotenoids, apricot helps to prevent any kind eye disorder. Studies show that eye disorders like cataract, muscle degeneration, and glaucoma is significantly reduced by the consumption of apricot juice. It also helps to improve the vision. Apricot contains a good amount of magnesium and phosphorus. These minerals help to enhance the functioning of the brain and also work to keep blood pressure at normal level. Most pregnant women are plagued with morning sickness. Consumption of apricot juice helps to settle nausea and indigestion. The tangy juice of apricot also provides extra calcium, iron, minerals, vitamins and antioxidants needed by pregnant women. Consumption of apricot and its juice has been linked with longevity. The vitamin A in the fruits has anti aging properties. Studies have shown that people who consume apricots in whole or as juice has longer and a healthier life span than others. Apricot is known as nectar of God, and rightfully so! With so much to offer, apricot nectar juice is sure a blessing from the heaven above! 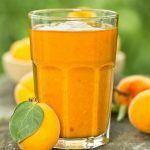 Was this article on apricot juice benefits helpful? Do share your views with us in the comments section below.